This is for all of my beautiful blogging friends. Be proud of yourself for putting yourself out there every day. It isn't easy hanging yourself out there for the whole world to see. Not everyone has the courage to do what you are doing. It is never too late to try something new and you are so far ahead of the pack just for trying. So give yourself a well deserved pat on the back. You deserve it. I've felt stuck in my hometown forever. Now my children live away, of course you know that! Me and Mr. H were talking tonight about getting the roof fixed and going with the 15 year warranty instead of 25. I told him I didn't intend to be living in this house in 25 years. I intended to be in Nashville in a few years. He said, "You really think that is going to happen." I asked, "You don't." He said, "I don't see it happening." I said, "Well, I do." Sometimes you got to have the courage to move on, start over. He's too afraid and too comfortable. Well, you've watched me start over! From doctor's wife to little blue house to patio apartment. Some would look at how much I've lost. I look at how content I've become in my own skin living alone with the pupsters. 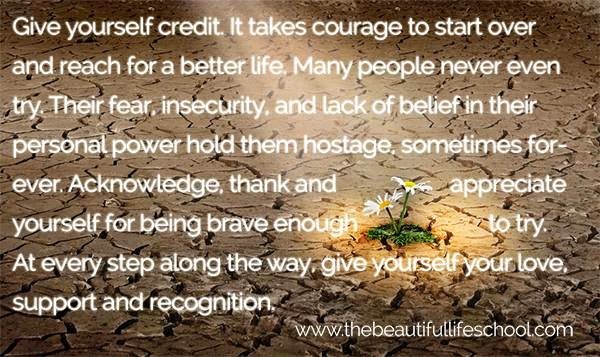 I had to start over in my late 40's and I'm so glad I found the courage to do it!